With most consumer products, it’s easy to follow the trends driving sales and design. Athletes drive the sales and design of shoes, clothing and other sporting goods, for example, and celebrities drive the sales of everything from soup to auto insurance. But can the same be said of popular music and electric guitars? Guitar makers certainly try. Rickenbacker relies on nostalgia for The Beatles and The Byrds to sell guitars; Gibson and Fender on Led Zeppelin, Cream and Jimi Hendrix. But this argument is tricky; record sales are collected and published and detailed data on guitar sales, especially from previous decades, is not. To consider this proposition in a bit more depth, let’s define popular music through the top-five selling singles or albums from each of the past decades and the design and popularity of the guitars at the time. To see Bill Haley rank so high was a surprise, as his selection of instruments seems directly tied to guitar design and sales, and the rockabilly movement was the start of guitar-based rock ‘n’ roll music. Rockabilly put guitar playing to the forefront of pop music, with Eddie Cochran and Gene Vincent expanding on Haley’s sounds and inspiring Jeff Beck, Eric Clapton and Jimmy Page, all of whom proved to be tastemakers of the future, selling millions of records and inspiring their own signature guitars. 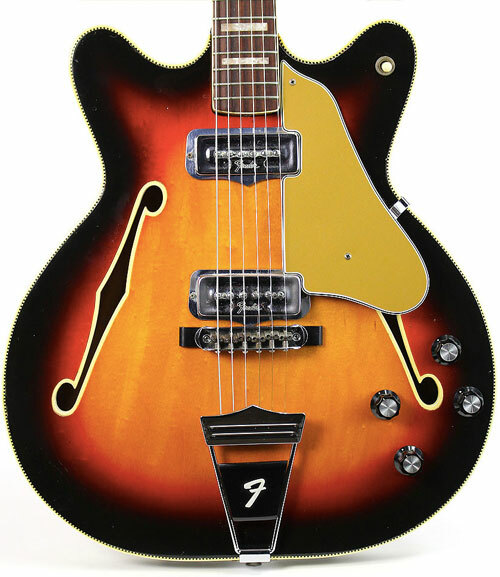 Haley's Gibson L7-C and Super 400 would set the stage for Gretsch to “borrow” their style for its line of semi-hollow electrics, driving the sound of early rock forward. Gretsch introduced the Chet Atkins 6120 in 1954, but when Filter’Tron humbuckers were added in 1958, the premier early rock model was born. The later solidbody Roundup and Duo Jet models offered a harder sound and a marked contrast to the big hollow bodies. It is also interesting to note that classic ballads were waning and that international music was sneaking into the charts. Guitar sales peaked in the late ‘60s and, as seen from the list, the impact of the Beatles on popular music simply cannot be overstated and seems to have driven sales of hollow-body guitars and inspired the launch of several new models. 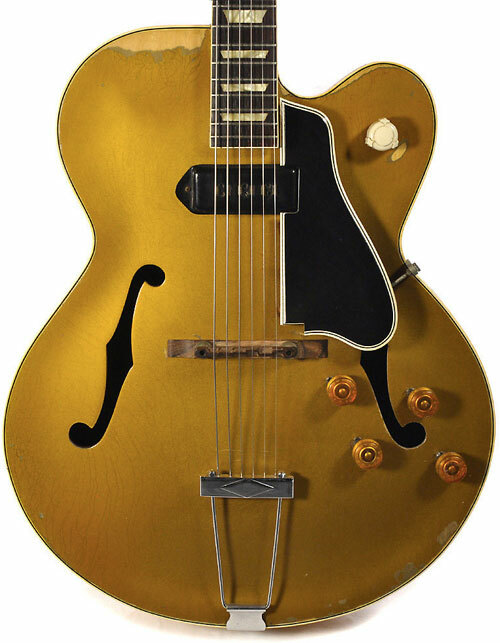 In addition to his Gibson J-160E and Gretsch Duo Jet, George Harrison notably played several hollow-body guitars, including Gretsch Country Gentlemen and the thinline Epiphone Casino, which also became a long-time favorite of Paul McCartney and John Lennon. Numerous artists point to the Ed Sullivan performance, in which Harrison played a Gretsch and Lennon played a Rickenbacker, as the reason they picked up a guitar. These models would drive the designs of future models from those and other manufacturers. Demand for hollow and semi-hollow guitars was strong enough that Fender, which was founded on the idea of solid-body guitars, launched the Coronado series in 1966. The Coronado is a thinline hollowbody with double cutaway, designed by Roger Rossmeisl, who previously was a designer for Rickenbacker. The Coronado I featured a single pickup, the Coronado II had two pickups and the Coronado XII was a 12-string; single- and double-pickup bass versions also were available. Fender discontinued the line ‘72. Gretsch’s double-cutaway Country Gentleman arguably was as much George Harrison’s signature model as it was Chet Atkins’. Paul McCartney has kept the Epiphone Texan popular and the Höfner Violin Bass in production, despite its less than ergonomic body shape. These models continue to drive the reissue market as well as lower-price-point models from many companies. While Led Zeppelin’s Jimmy Page has played now-vintage guitars, such as his 1959 Les Pauls, since the early days of Zep', it’s noteworthy that Gibson had discontinued the Les Paul in 1961 to launch the SG. And, at the time, the Les Paul predominantly was marketed as a jazz guitar. Page’s continuing reliance on the Les Paul — and its wider adoption by other British blues players — must have contributed the Les Paul’s resurgence, although Gibson would take a while to offer the “right” reissue. 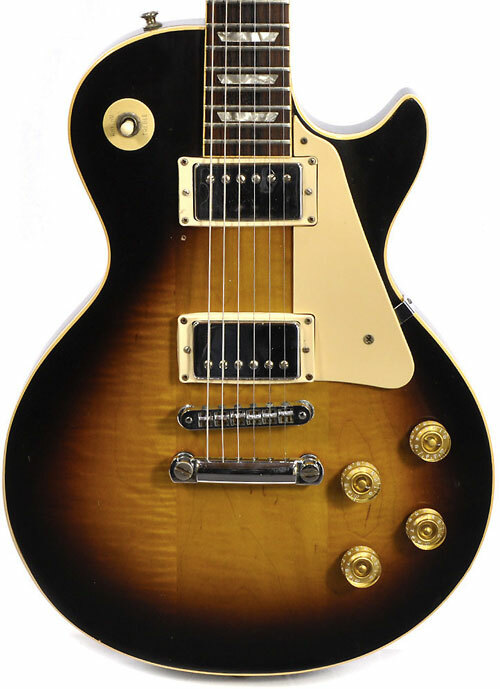 Consider Gibson’s introduction of Les Paul Standards with P-90s, and Deluxe models with mini-humbuckers, and the reissue of the Custom before finally reissuing the sunburst Standard with humbuckers in the 1970s, although with various multi-piece bodies and necks till the late ‘80s. In the earliest part of the ‘70s, folk music was still well represented on the charts, and acoustic instrument sales surged with the ready availability of inexpensive Japanese imports, such as the Yamaha G series and those from Takamine serving as the first instrument for many players. Ovation, which produced one of the first reliable acoustic-electrics, also benefited from this renewed interest in acoustic music. And it’s interesting to note that Led Zeppelin IV contained nearly as many folk-inspired tracks as blues inspired pieces. 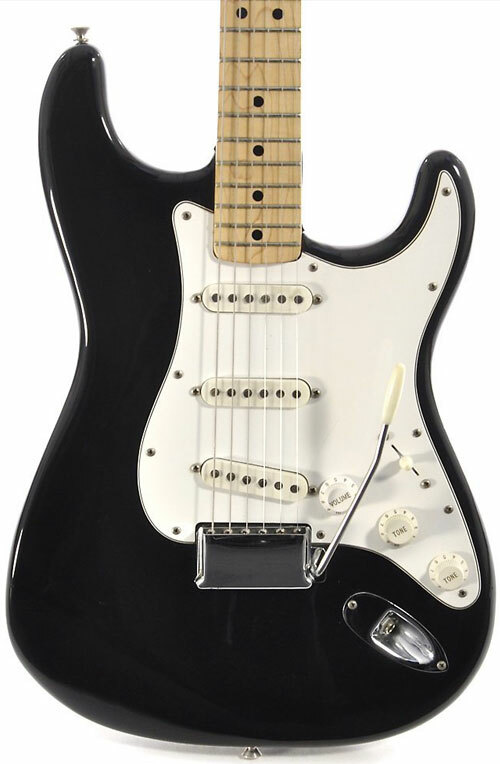 Pink Floyd always has been a guitar-driven band and Gilmour's black Stratocaster and staggering use of effects did much to cement rockers’ attachment to the Fender sound. And, again, Jimmy Page cemented the rock image of the low-slung Les Paul and maxed Marshall. The popularity of Fleetwood Mac, though very much a guitar-driven band, didn’t manifest in huge sales of the Turner Model 1, Lindsey Buckingham’s unique main guitar. While disco and folk were less focused on lead guitar, softer rock from the likes of Fleetwood Mac and hard rock, such as from Pink Floyd and Led Zeppelin, still held guitar at the forefront in terms of song composition. In terms of album sales, guitar was still king, as in the 1960s, but popular tastes were changing. The 1980s brought some interesting trends in music, with pop/dance leading the charge. The enormous success of Thriller must have done a great deal to drive sales of Fender Stratocasters and Super Strats through Eddie Van Halen, who famously played the solo on “Beat It,” that record’s third single. Credit where it’s due, however; Van Halen already had done much to support the Super Strat as a dominant guitar of the ‘70s and ‘80s with the success of his own band. The beautiful guitar work of Mark Knopfler helped keep Stratocasters in the public eye, though he frequently was seen throughout the decade with Pensa-Suhr Stratocaster-type models and the occasional Steinberger. The Edge of U2 has played many instruments though the Stratocaster has always been among his most favored guitars. Springsteen has always been an Esquire/Telecaster standard bearer, but on Born in the U.S.A, guitars play a more supportive role in the E Street Band; remember that Steven Van Zandt, after playing on the record, left the band in '84 and Nils Lofgren hadn’t yet joined. Live performances of Michael Jackson's Bad brought guitarist Jennifer Batten forward, and her arsenal of Super Strats was well in line with the guitar aesthetics at the time. While Stratocasters were dominant in the ‘80s, Fender changed owners, lost production capability and launched new ventures, including a new factory in Mexico and Fender Japan, to keep production flowing. The 1990s marked a return for guitar-driven music. 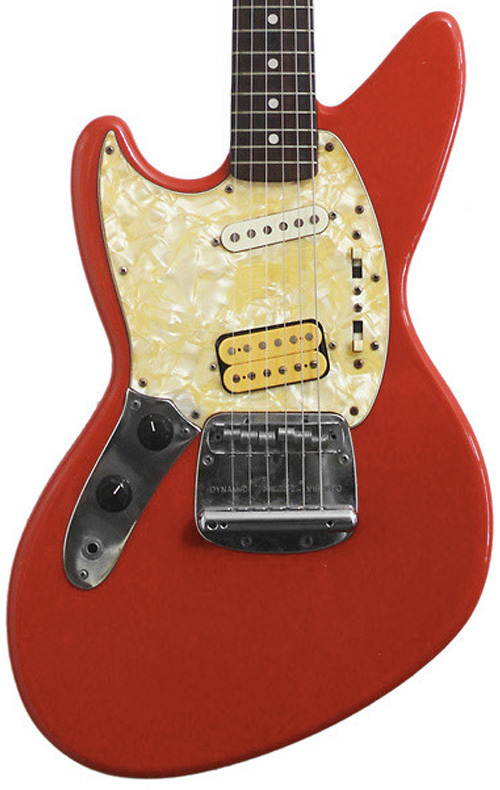 Nirvana’s Kurt Cobain notably brought renewed interest to Fender Jaguars, which were discontinued in 1975 and relaunched in 1999, and Mustangs, which were discontinued in ‘82 and relaunched in ‘90, as well as lower-end and odd guitars, such those from Univox and other Japanese makers. Fender also posthumously released a signature series Jag-Stang, which Cobain had a hand in designing, Jaguar, and a Mustang. Morissette's popular album was arguably a reiteration of grunge values, though a more pop version, and certainly didn’t hurt guitar sales. Whitney Houston probably didn’t do much to drive guitar sales. But Metallica likely advanced interest in guitars and guitar playing, absolutely helped put ESP on the map and likely supported sales of Super Strats. Finally, Santana had a huge presence before Supernatural, and PRS, which offers a Santana signature line, likely benefited as a result. The 2000s and 2010s are more difficult eras to define, as the guitar was clearly out of the picture in the popular music scene in terms of record sales. However, these decades also saw the rise of digital music and downloading, which made it music easier to access without sales being recorded. While the enduring popularity of The Beatles can’t be overstated — as their album of previously released music sold better than most of the new material released in the decade — the 2000s largely were about rap going mainstream and being coopted by pop and metal acts. Blending rap and rock, while adding more pop sensibilities than Nu-Metal’s harder forebearers like Korn and Limp Bizkit, Linkin Park became one of the best-selling bands of the decade with their album Hybrid Theory, which the band reportedly worked on for five years before its release. One of the hallmarks of Nu-Metal is the use of seven-string guitars, such as the Ibanez Universe U7, which was created for Steve Vai in 1990. 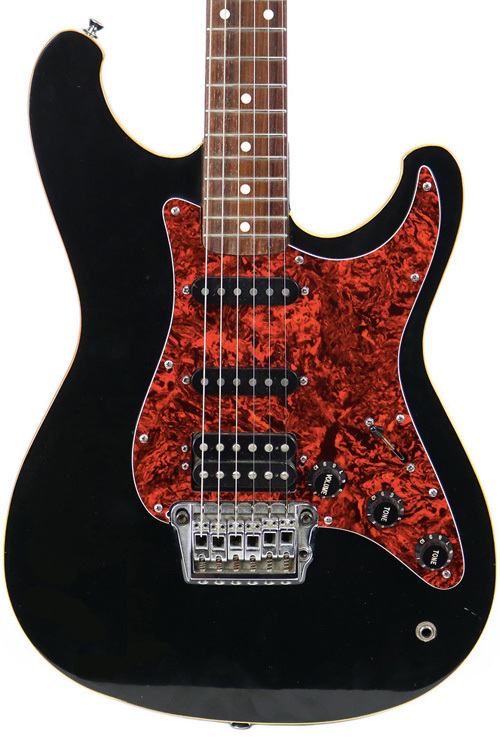 Though the company created a variety of seven-string models, all of them were discontinued by the end of ‘94 due to poor sales. 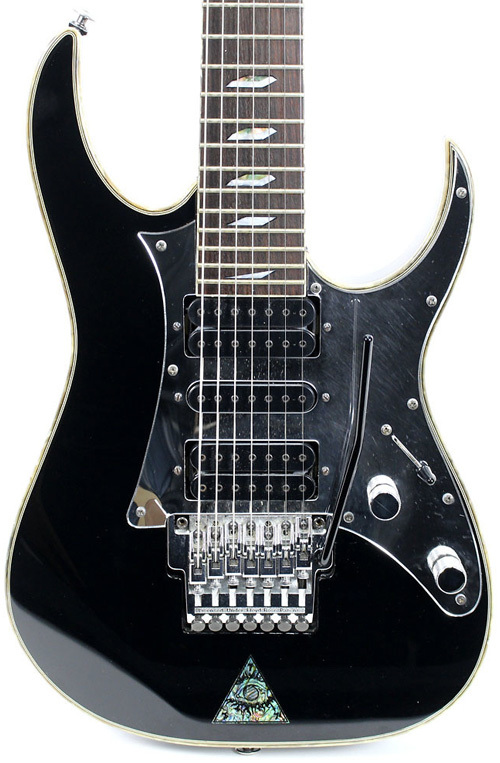 The adoption of seven-string guitars by Nu-Metal bands in general and Linkin Park in particular likely did a great deal to bring seven-string guitars back into production and contributed to the resurrection of the UV7BK in 1996, the launch of the UV7SBK in ‘97, and its replacement, the UV777BK in 1998, as well as the RG7620, which specifically found favor with the band. The 2010s have seen a massive reduction of guitar in pop music, which is now dominated by ballad singers like Adele and cross-genre artists like Taylor Swift. 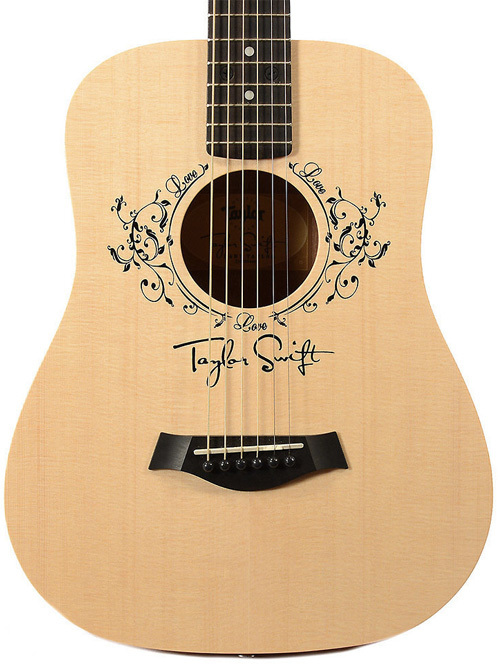 While Swift may not be at the forefront of keeping guitars relevant, Taylor Guitars produces her signature Taylor Swift Baby Taylor model and her live shows usually feature her playing guitar with a band on at least some tunes (including a sporty Johnny Marr Signature Jaguar). Of course, this decade has also seen a marked change in the way fans purchase and consume music, so the relevance of album sales as a metric of popularity is probably not as valid as it was in the '60s. So Does Pop Music Drive Guitar Sales? It seems safe to say that pop music historically has influenced guitar design and sales, as the most iconic designs emerged at a time when pop music was dominated by guitar. However, that may be less true now. Since the turn of the century, the guitar clearly has been receding in terms of its prominence in popular music as measured by album sales. And as a result, one might expect guitar sales to have declined precipitously. 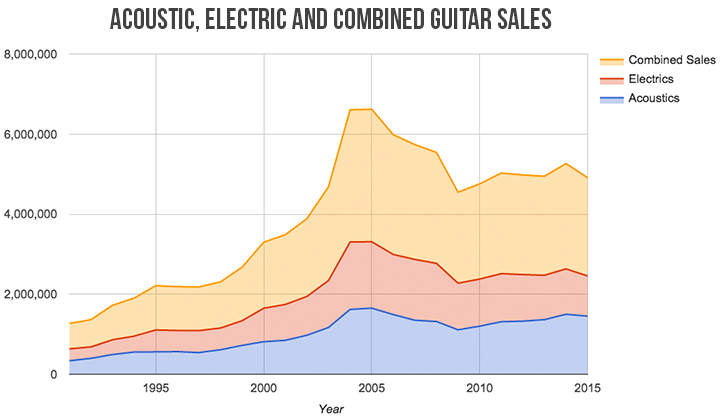 And yet guitar sales have increased since 2000, and have risen since 1991, albeit unevenly. We may now be seeing the emergence of new forces driving the design and sales of guitars. The past three decades also saw the fragmentation of media and audiences, leading to sizable followings for bands that release their own music. Phish, for example, has never had a No. 1 record or significant national radio play, and yet Trey Anastasio, the band’s guitarist and vocalist, has clearly influenced a massive following of players and the band’s total ticket sales exceed $250 million. Even more recently, guitarists like Annie Clark of St. Vincent and Dan Auerbach of the Black Keys have captured the tastes of large segments of guitarists, yet remain lesser-known names when compared to the iconic guitar players of earlier decades. The Annie Clark Signature from Ernie Ball Music Man was met with plenty of hype at NAMM this year, but there were still probably plenty of guitar players who had to google her name to hear her music for the first time.